Attorney John Rinehardt earned his law degree at the Ohio State University College of Law and was admitted to the practice of law in 1986. Ever since, John has devoted his legal expertise to helping the victims of wrongdoing obtain justice in the courts of Ohio. In his extensive experience, John has successfully handled cases where someone has been hurt or killed in cases involving defective products, unsafe industrial machines, reckless driving, vicious dog attacks, unguarded factory machine malfunctions, slip and falls, car wrecks caused by drunk drivers, electrocutions, nursing home neglect, and many other situations. Based on positive client reviews, John received the Clients’ Choice Award by Avvo and the Client Distinction Award from Martindale-Hubble. Less than 1% of the 900,000+ attorneys listed on Lawyers.com and Martindale.com have received this distinction. Avvo is an online legal services marketplace that provides attorney ratings. John is rated 10/10. John donates time and money to many local causes including MADD, inner-city youth basketball leagues, Mid Ohio Youth Mentoring, and DARE. John also serves on the Board of Directors for the Richland County Humane Society. John and Hillary were the attorney advisors for Lexington local school’s mock trial team for six years. When he isn’t fighting for his clients, John loves to spend his time fishing and hiking. In 2001, the National Board of Trial Advocacy certified John as a Civil Trial Advocate. To become board certified, John had to provide proof of his extensive trial experience and then had to pass a written examination. Less than 1% of the attorneys in the United States have earned the Civil Trial Advocate board certification. John was re-certified with the National Board of Trial Advocacy in 2011 and 2016. In 2012, the Million Dollar Advocates Forum certified John as a member. In 2015, the Multi-Million Dollar Advocates Forum certified John as a member. The Million Dollar Advocates Forum is recognized as one of the most prestigious groups of trial lawyers in the United States. Membership is limited to attorneys who have won million dollar and multi-million dollar verdicts, awards, and settlements. Fewer than 1% of U.S. lawyers are members. Forum membership acknowledges excellence in advocacy and provides members with a national network of experienced colleagues for professional referral and information exchange in major cases. 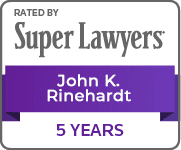 John was selected to be listed in Super Lawyers magazine in 2012 and again in 2015, 2016, 2017 and 2018. Super Lawyers is a rating service of outstanding lawyers from more than 70 practice areas who have attained a high degree of peer recognition and professional achievement. The selection process is multi-phased and includes independent research, peer nominations, and peer evaluations. In 2018 John received the additional honors of being selected to the top 100 attorneys in the state of Ohio and the top 50 attorneys in Cleveland.